A beautifully presented, updated, extended and remodelled Detached family home, ideally located, within walking distance to Hale Barns Village Centre, the Synagogues at Wicker Lane and Shay Lane, Holy Angels Roman Catholic Church and the Islamic Cultural Centre on Grove Lane. In addition The Well Green school and Halecroft Park are literally on the doorstep. The well proportioned property is arranged over Two Floors and extends to some 1532 sq ft comprising; a Hall, WC, Family Room, Living/Dining Room and Breakfast Kitchen in addition to a Utility to the Ground Floor and there are Four Double Bedrooms served by Two Bath/Shower Rooms to the First Floor. Externally, the property enjoys a generous private corner plot with ample off road Parking and delightful Gardens, with the Garden to the rear being South West facing therefore enjoying a sunny aspect. Enclosed Porch with uPVC door and tiled floor. Glazed Entrance door leading to a Hall with spindle balustrade staircase rising to the First Floor. Doors provide access to the Ground Floor Living Accommodation. Chrome finish halogen lighting. Coved ceiling. 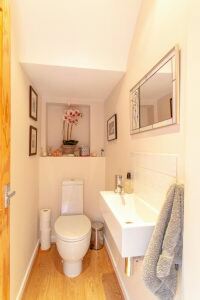 Ground Floor WC fitted with a modern white suite and chrome fittings, providing a wash hand basin and WC. Tiling to the sink area. Chrome finish halogen lighting. Family Room with two uPVC double glazed windows to the front elevation enjoying delightful views over the front Gardens. Access to useful under stairs storage. Chrome finish halogen lighting. Coved ceiling. Living and Dining Room is a Double Reception Room with uPVC windows enjoying views to both front and rear Gardens. Gas living flame coal effect fireplace with stone surround. Halogen lighting. Breakfast Kitchen with clearly defined areas. To the Breakfast Area there are uPVC windows to both the side and rear elevation enjoying views over the Garden and a door provides access to the same. Chrome finish halogen lighting. Coved ceiling. The Kitchen Area is fitted with an extensive range of base and eye level units with granite worktops over, inset into which is a stainless steel sink and drainer unit. Integrated appliances include a fridge, microwave oven and dishwasher. There is space for a Range cooker. Double glazed uPVC window to the rear enjoying delightful views over the Gardens. Chrome finish halogen lighting. Tiled floor. Utility Room with base level units with worktops over, inset into which is a stainless steel sink and drainer unit with mixer tap over. Space and plumbing for a washing machine and dryer. Double glazed uPVC window to the side elevation. Wall mounted gas central heating boiler. Tiled floor. To the First Floor Landing there is access to Four Double Bedrooms and Two Bath/Shower Rooms. Loft access point. Chrome finish halogen lighting. Bedroom One is a Double room with uPVC window to the rear elevation enjoying delightful views over the rear Gardens. There are a range of built in wardrobes, cupboards and bedside units providing ample hanging and storage space. Chrome finish halogen lighting. Coved ceiling. This room enjoys an En Suite Shower Room fitted with a modern white suite and chrome fittings, comprising a double width shower cubicle with thermostatic shower and glazed screen, wash hand basin and WC. Extensive tiling to the walls and floor. Double glazed uPVC window to the rear elevation. Built in mirrored cupboard. Chrome finish halogen lighting. Chrome finish heated towel rail. Bedroom Two with uPVC window to the front elevation. There is a range of built in furniture comprising wardrobes, cupboards and dressing table providing ample hanging and storage space. Bedroom Three with uPVC double glazed window to the front elevation. Coved ceiling. Bedroom Four with two inset Velux windows and an additional stained and leaded glass window to the side elevation. There is access to a curtained storage space. Chrome finish halogen lighting. The Bedrooms are served by the Family Bathroom fitted with a modern white suite and chrome fittings, comprising a bath with thermostatic shower over and glazed screen, wash hand basin and WC. Extensive tiling to the walls and floor. Double glazed uPVC window to the rear elevation. Chrome finish halogen lighting. Chrome finish heated towel rail. 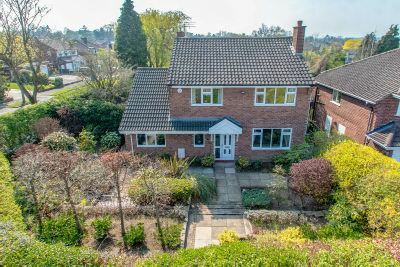 Externally, the property enjoys a generous corner plot with a Driveway to the rear providing ample off road Parking for several cars. The landscaped Gardens to the front are designed with paved and planted areas on raised levels are enjoy a great degree of privacy enclosed within hedging. There is a large Timber Shed at the side of the property. The Gardens enjoys a South West facing and therefore sunny aspect.